Background: Self-rated oral health is a useful and essential indicator of overall oral health status which has an impact on general well-being and quality of life. No study on the perception of oral health has been conducted among young adults in Port Harcourt. Thus, this study investigated whether sociodemographic factors and oral health practices were associated with self-reported oral health status in a young population in Port Harcourt. Methods: A cross-sectional survey conducted among young undergraduate students in the University of Port Harcourt, Rivers State. Data were collected using pre-tested self-administered questionnaires and analysed using the Statistical Package for Social Sciences version 21.0. Results: There were 120 respondents, all within 16–34 years old, with the mean age of 21.7 ± 3.8 years. More females 61 (50.8%) than males 59 (49.2%). A total of 5 (4.2%) are married and 66 (55%) were in health sciences. Out of 42 (35.0%) of the respondents that had utilised dental service in the past; complaints of a toothache accounted for 52.4%. The percentages of participants that rated their oral health as excellent, good, fair and poor were 20.8%, 58.4%, 16.7% and 4.2%, respectively. Sociodemographics factors, such as age, gender, course of study, level of study and monthly allowance were significantly associated with self-rated oral health (P < 0.05). Oral health practices for example, previous dental visit, type of toothbrush used and frequency of tooth brushing were also significantly associated with perceived oral health. Conclusions: The perceived high oral health status of participants was influenced by sociodemographic factors and oral health practices. However, there is poor utilisation of dental services among the students. Self-rated oral health is a useful and essential indicator of overall oral health status; which in turn have an impact on general well-being and quality of life., Perceived oral health status has been found useful in determining dental treatment needs, predicting oral health behaviour, performing routine diagnostic procedures and collecting dental information on young and adults.,, It is also a useful tool for planning and monitoring oral promotion interventions. Ostberg et al. emphasised that surveillance of oral health in young people should include information on self-rated oral health. Self-rated oral health has been found to be associated with sociodemographic, clinical and socioeconomic status. However, most of the studies in our environment were conducted in the adult population., Thus, it is valuable to identify the determinants of self-rated oral health in young undergraduate people. Furthermore, many university students lived on their own far away from home and faced with the responsibility for their own health, lifestyle and behaviour, and during this period, poor health behaviour may affect self-rated oral health. Thus, it is important to focus on any factors related to self-rated oral health in university students. We hypothesised that factors such as sociodemographic factors and oral health practices do not influence self-rated oral health in the University of Port Harcourt undergraduate students. The purpose of this study was to investigate whether sociodemographic factors and oral health practices were associated with self-reported oral health (SROH) status in a young population in Port Harcourt. This cross-sectional survey was conducted among young undergraduate students in the University of Port Harcourt, Rivers state between October 2016 and July 2017. The students were randomly selected at the convocation arena where students from the various faculty of the University often assemble to receive lectures. The objective of this study was explained to the participants, and informed consent was obtained before administering the questionnaires. Those who declined to participate in the study were excluded from the study. A total of 160 questionnaires were distributed, and 120 properly completed questionnaires were found usable. Ethical approval was obtained from the Research and Ethics Committee of the University of Port Harcourt Teaching Hospital. The self-administered and semi-structured questionnaire was pre-tested among nursing school students not selected for the study. Necessary modifications were made to the questionnaire before data collection to ensure the validity and reliability of the questionnaire. Questionnaires contained information on sociodemographics, oral health practices and self-rated oral health status. Participants were asked to rate their oral health as excellent, good, fair and poor. Data analysis was done with the Statistical Package for the Social Sciences (Version 21.0. IBM Corp., Armonk, NY, USA), descriptive statistics were obtained and frequency distribution calculated. Statistical significance was done with the Chi-square test and logistic regression to identify the determinants that were strongly associated with SROH status. For binary logistic regression analysis, response variable, namely SROH status was transformed to binary variables as good (excellent + good) versus poor (fair + poor). P ≤ 0.05 was considered to be statistically significant. A total of 160 questionnaires were distributed and 120 properly completed questionnaires were found usable giving a response rate of 75%. All the respondents were within 16–34 years age range with a mean age of 21.7 ± 3.8. There were more female (61, 50.8%) than males (59, 49.2%) and only 5 (4.2%) are married. Most 66 (55%) of the respondents were in the health sciences. Majority 101 (84.2%) of the students are dependent on their parent, and 78 (65.0%) receive a ≤10,000 naira monthly allowance as shown in [Table 1]. The number and percentage of the participants that rated their oral health as excellent, good, fair and poor were 25 (20.8%), 70 (58.3%), 20 (16.7%) and 5 (4.2%), respectively. Most of the students ≤25 years of age rate their oral health as good (72/102) and excellent (24/102) while those above 25 years have fair (9/18) and good (8/18) self-rated oral health [Table 2]. More females (70.5%) rate their oral health as good compared to 45.8% of males. Furthermore, all the students irrespective of their monthly allowance rate their oral health as good. 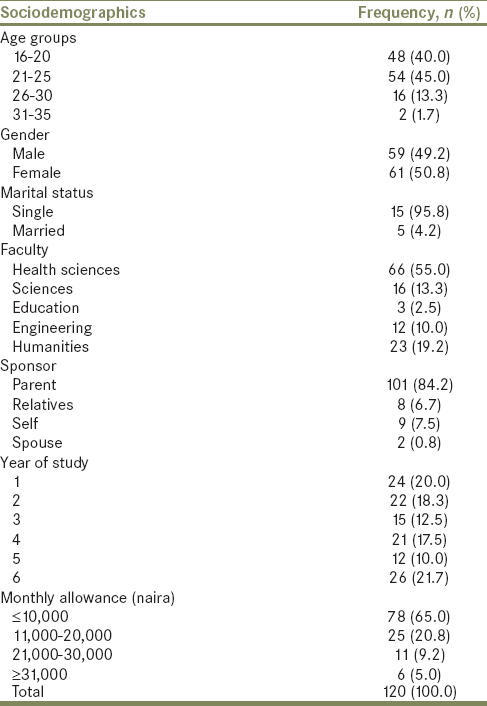 Sociodemographics factors for example, age, gender, the course of study and monthly allowance were found to be significantly associated (P < 0.05) with self-rated oral health as shown in [Table 2]. Perceived oral health status was considered to be good among those with previous dental service utilisation more than those that have not visited a dentist; though 29.5% of those without previous dental visit rate their oral health excellent. Oral health practices for example, previous dental visit, type of toothbrush texture used and frequency of tooth brushing were found to be significantly associated with perceived oral health status as shown in [Table 3]. 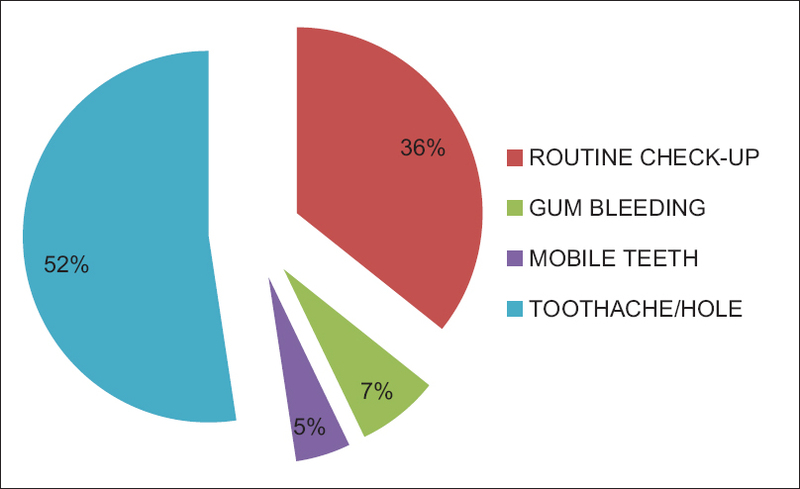 Out of 42 (35.0%) of the respondents that had utilised dental service in the past; complaints of toothache accounted for 52.4% as shown in [Figure 1]. Logistic regression modelling identified three independent variables (gender, toothbrushing aid and frequency of toothbrushing) to be significantly associated with SROH status. The frequency of toothbrushing (odds ratio 4.1; 95% confidence interval [CI]: 1.27–13.0) and gender (odds ratio 3.7; 95% CI: 0.99–13.5) have a higher odds of predicting the students' perceived oral health status compared to the other variables as shown in [Table 4]. This study examined the SROH status among university students in the South-South region of Nigeria. SROH is a subjective patient-centred measure of oral health which involves the individual in the decision-making process and assessment of their oral health. Perceived oral health status has been found useful in determining dental treatment needs, predicting oral health behaviour, performing routine diagnostic procedures and collecting dental information on young and adults. Half of the participants used medium-textured toothbrushes (57.5%) and brushed twice daily (54.2%). This is higher than what has been observed in previous studies.,,, Our findings may have been influenced by information obtained from schools and the media by the students. Furthermore, most of them reside in a tertiary hospital environment where they are likely to have benefitted from dental outreaches. A greater proportion of females than males, in contrast to other studies,, rated their oral health as good. This observation may be related to the fact that, women have been found to be more likely to visit dental clinics and to report dental symptoms than men., Our findings showed that those who have made use of dental services in the past rate their oral health as good. This is in contrast to the findings by Olutola and Ayo-Yusuf where those with previous dental visits rate their oral health as poor. Individuals who do not practice routine dental check-ups or wait more than 3 years between visits have been found to have an increase in the prevalence of negative self-rated oral health since oral health problems may progress without professional care, causing pain, discomfort and irreversible damage to teeth. The findings in this study showed that sociodemographic variables and oral health practices are the major determinants of SROH among university students. This study may have selection bias due to the sampling method. Studies with higher representative numbers from different faculty may give a more accurate understanding of the perceived oral health status of the undergraduate students. Most of the respondents rate their oral health as good. Perceived good oral health status was common among females, respondents using medium-textured toothbrushes, those that brush twice daily and those with a previous dental visit. The odds of rating good oral health status among the respondents was highly determined by gender and frequency of toothbrushing. The perceived high oral health status of the participants in this study was influenced by sociodemographic factors and positive oral health practices. However, there is poor utilisation of dental services among the students. We recommend routine oral check and oral hygiene education among undergraduate students. Further studies are needed for determining the correlation between SROH status and intraoral clinical status of the students. Kojima A, Ekuni D, Mizutani S, Furuta M, Irie K, Azuma T, et al. Relationships between self-rated oral health, subjective symptoms, oral health behavior and clinical conditions in Japanese university students: A cross-sectional survey at okayama university. BMC Oral Health 2013;13:62. Aikins EA, Braimoh OB. Self-rated oral health status and associated factors in adult population in Port Harcourt Rivers State Nigeria. J Sci 2015;5:505-10. Ueno M, Zaitsu T, Ohara S, Wright C, Kawaguchi Y. Factors influencing perceived oral health of Japanese middle-aged adults. Asia Pac J Public Health 2015;27:NP2296-304. Luchi CA, Peres KG, Bastos JL, Peres MA. Inequalities in self-rated oral health in adults. Rev Saude Publica 2013;47:740-51. Pattussi MP, Peres KG, Boing AF, Peres MA, da Costa JS. Self-rated oral health and associated factors in Brazilian elders. Community Dent Oral Epidemiol 2010;38:348-59. Ostberg AL, Lindblad U, Halling A. Self-perceived oral health in adolescents associated with family characteristics and parental employment status. Community Dent Health 2003;20:159-64. Olusile AO, Adeniyi AA, Orebanjo O. Self-rated oral health status, oral health service utilization, and oral hygiene practices among adult Nigerians. BMC Oral Health 2014;14:140. Peker K. The Determinants of self-rated oral health in Istanbul adults. In: Mandeep V, editor. Oral Health Care Pediatric, Research, Epidemiology and Clinical Practices. Istanbul: InTech, 2012. Braimoh OB, Udeabor SE. Self-assessed oral health behaviour and knowledge of undergraduate medical students. Afri J Med Sci 2012;5:55-9. Umesi-Koleoso DC, Ayanbadejo PO. Oral hygiene practices among adolescents in Surulere, Lagos state, Nigeria. Nig Q J Hosp Med 2007;17:112-5. Olutola BG, Ayo-Yusuf OA. Socio-environmental factors associated with self-rated oral health in South Africa: A multilevel effects model. Int J Environ Res Public Health 2012;9:3465-83. Gilbert L. Social factors and self-assessed oral health in South Africa. Community Dent Oral Epidemiol 1994;22:47-51. Locker D, Jokovic A, Payne B. Life circumstances, lifestyles and oral health among older Canadians. Community Dent Health 1997;14:214-20. Afonso-Souza G, Nadanovsky P, Chor D, Faerstein E, Werneck GL, Lopes CS, et al. Association between routine visits for dental checkup and self-perceived oral health in an adult population in Rio De Janeiro: The Pró-Saúde Study. Community Dent Oral Epidemiol 2007;35:393-400.